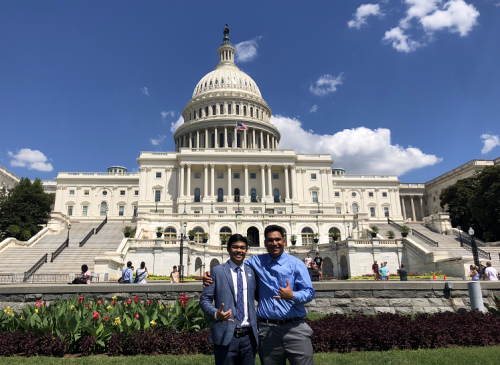 This past summer, Chaminade students Andrew Ancheta ‘21 and Edward Adachi ‘21 attended the Catholic Relief Services (CRS) Student Ambassador Leaders Together (SALT) Summit 2018 Conference from July 15-18. Both students are currently CRS Student Ambassadors at Chaminade University of Honolulu through Campus Ministry. At the CRS SALT Summit Andrew and Edward, along with students from 60 other colleges and universities, gathered in Baltimore, Maryland to meet other CRS Student Ambassadors, advisors and CRS staff and experts to build leadership skills rooted in CRS values and characteristics. 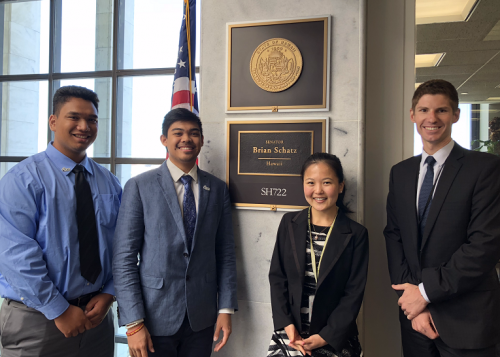 The conference included advocacy training and preparation for advocacy meetings on Capitol Hill with the offices of Hawaii’s Senators and Representatives. Growing up Catholic, Andrew says the hardest part is incorporating his faith into everyday life. Through this conference he was able to exercise his faith by giving a voice to the people who do not have one. Advocacy is an important part of Catholicism that others do not realize. Newly baptised into Catholicism this past Easter season at Mystical Rose Oratory, Edward says that you can be whatever you are—Catholic, non-religious, etc.—and still contribute to the solution of current issues our world is facing. Sometimes that solution can be as small as educating people and bringing awareness to issues like climate change, homelessness or world hunger. Because, as people become more aware of the problem, they become a part of the solution. “A lot of people think that CRS just provides food for those in need,” says Andrew. “But CRS focuses more on eliminating the need for emergency services.” CRS helps people maintain their independence and stand on their own two feet. A big issue for the Pacific Islands is climate change and a big contributor is the pollution of plastic goods. Andrew and Edward’s friend from Missouri now sees that her actions in Missouri, like using and discarding plastic goods, contribute to the larger problem of climate change that may affect her friends in the Pacific. Andrew and Eddie also learned that the same goes for those of us who live in the Pacific—our actions could affect our friends on the U.S. mainland. One last thing that Andrew and Edward took away from the conference was the application of the Characteristics of Marianist Universities. At the CRS SALT Summit Conference, all the CRS Student Ambassadors worked for service, justice and peace. Andrew and Eddie brought their integral, quality education from Chaminade University and together worked with their fellow Ambassadors as one community to reach one goal in family spirit advocating to their state representatives for the Catholic Church to support Catholic Relief Services. “The world is constantly changing,” Andrew says, “We were taught to keep up with changes in the world and to be aware of what is going on.” As CRS Student Ambassadors, Andrew and Edward have to adapt themselves to ensure people are constantly learning about our current world problems through whatever means necessary.